12 Exotic Couple Spa Experiences around the World you can't miss! Keeping this in mind, we have listed down some of the most exquisite and totally off-beat couple spas to rejuvenate your honeymoon romance and give it a head start! This resort, located in the heart of Bali overlooks the beautiful beaches of Jimbaran bay. Ayana’s majestic sunsets and ocean-front views are complemented by a scenic white-sand beach. Spa Experience - Ayana is renowned for its relaxing massages and ancient healing remedies, and no trip to the island is complete without experiencing the World’s Best Spa, Thermes Marins Bali, as voted by Conde Nast Traveler readers. 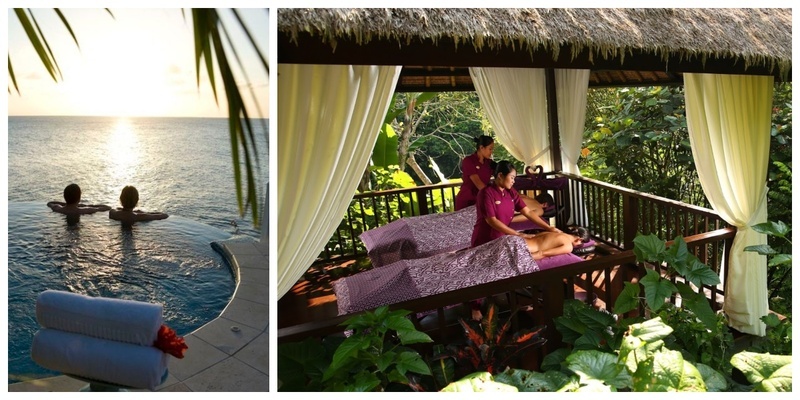 This world-class spa massage offered by Ayana, includes Aquatonic Seawater Therapy Pool and Spa on the Rocks treatment villas. What better than Switzerland, the city of dreams for a romantic honeymoon experience? Rising high on Mount Bürgenstock, the Honegg Villa offers luxurious rooms with balconies and a heated infinity pool overlooking Lake Lucerne. Spa Experience - With relaxing underwater music, this Villa also provides with its special Hawaiian temple massage- A combination of energy and bodywork for mental and physical relaxation of the body ‘temple of the soul’! With the perfect blend of Cycladic architecture with modern amenities, this resort and spa centre located in Agios Ioannis in Mykonos, includes an amazing spa centre, infinity pool with glittering LED lights, a hot tub and exquisite Mediterranean cuisine. Spa Experience - The special holistic spa treatment for body and face begins with a full back massage to induce a state of relaxation and soothe aching muscles. A fabulous antioxidant body peeling salt to cleanse, exfoliate and hydrate, while finishing with an antioxidant mini facial. Let yourself feel absolute relaxation while pampered with unique Dead Sea mud. Offering panoramic views of the Swiss Alps, the Cambrian is located in the centre of Adelboden. Spa Experience - It features a 700 m² spa area and a heated outdoor pool overlooking the mountains. Their treatments are specially designed to soothe mind, body and spirit, and to take a wholly holistic approach to wellbeing. One can enjoy the unique views of mountains and waterfalls from the sun terrace and the lounge, which features a beautiful fireplace as well. Placed beachfront in Carlisle Bay, Curtain Bluff boasts one of the most exotic locations. The heated pool gives the direct view of the beach, so that you soak yourself in the hot water while imagine the experience of floating in the sea. Spa Experience - The spa in here offers innovative massage techniques like Swedish spa, Shiatsu spa to deep tissue spa. If you are planning for a perfect getaway, this is the one to go for. Surrounded by the scenic Green Mountains, this resort boasts a full-service spa and an 18-hole golf course Bromley Mountain skiing at a very close distance. Spa Experience - The Spa at The Equinox invites one to relax and refresh their mind, body, and spirit altogether. The special Equinox therapeutic massage spa utilizes indigenous products, as well as elements of Vermont’s natural beauty, to create a healing and revitalizing atmosphere. Located amidst the serene snow-filled mountains of Kleinwalsertal Valley, the resort offers a spa area with a heated pool with a beautiful view of white mountains all around. Decorated in a delightful traditional modern Alpine-Style, the resort has a fantastic Spa & Fitness centre. Spa Experience - The special Zirben-Infrarot-Warmekabine with Microsalt spa offers the local effect of the infrared heat paired with the ethereal scent of pine wood which makes it possible to alleviate a variety of back complaints, such as painful cramps and tension, joint pain caused by wear and other nonspecific back pain. The ethereal scent of pinewood soothes the mind and allows deep relaxation. Every treatment in ESPA is tailored to slowly peel away the tension and worries that envelope you, allowing you to experience complete relaxation for your mind, body and soul. This place is definitely a tranquility of oasis amidst a beautiful forest surrounding the place from all the four directions. Spa Experience - The special stress reliever ritual address a comprehensive range of conditions and syndromes using specialist treatments and signature products, to ensure the best physical and emotional therapeutic benefits. Overlooking the Ayung River, the luxurious Hanging Gardens of Bali offers villas with a private infinity-edged pool. Exceptional Spa and Wellness experience in the heart of Ubud’s jungle preserve on the holy river of Ayung. Spa Experience - Featuring traditional Balinese décor, one can enjoy the traditional Balinese treatments overlooking the fast flowing rapids of the Ayung river with a lush jungle backdrop. The special Chi Rejuvenation Massage therapy offered by the Hanging Gardens, revitalises the Chi energy flow in the body, restoring your body’s natural balance and well-being. Blessed with the stunning location of being at the edge of the tropical Petanu Valley, this resort is the best getaway for your perfect honeymoon. Escape the city life and connect with nature in Kamandalu Ubud, a place that offers promising experience with modern amenities. Spa Experience - The personal therapists here, offer Balinese treatment beneath the canopy of trees. The traditional Balinese Massage includes firm hand stroke with full palm pressure, kneading and skin rolling techniques. This massage uses traditional essential oils for warmth and circulation. Sounds like the perfect place, if you have a knack for natural beauty. Huvafen Fushi is a luxurious resort located in the North Malé Atoll in the Maldives. Spa Experience - World’s first place to offer underwater rejuvenating massage. An underwater spa in Maldives offers complete relaxation in a surreal, submerged environment with tropical fishes weaving through the currents dissolving all your tensions. The historic Omni Grove Park Inn in Asheville, North Carolina offers views of the Blue Ridge Mountains and features solid oak pieces in the rooms.The subterranean spa features mineral pools, sauna, and steam room for an additional fee. Spa Experience - Loosen up at The Spa at The Omni Grove Park Inn with twenty water features, including numerous mineral-based pools, complementing the subterranean spa with cavernous rock walls, arches and tunnels. The wide range of spa at the resort covers blue ridge symphony massage to grove park classic and stone massage. Enjoy peace and silence along with two therapeutic waterfall pools as well as a lap pool blanketed with fiber-optic stars and underwater music. So, have you started packing your backpacks yet?